On January 1, 1999, Walkerton became part of the Municipality of Brockton. Walkerton was originally part of Brant County and was first settled in 1849 by William Jasper and Edward Boulton who farmed to the east of the river. Other settlers from the same era included John Lundy, Moses Stewart and Thomas Bilkie who farmed to the west of the river. Joseph Walker arrived from Ireland in 1850 and is considered one of the founders of Walkerton. He built both saw mills and flour mills, surveyed the area into a town plot and encouraged businesses to locate here. Years later, Walker was the reeve of Brant for several terms, and was elected as the first mayor or Walkerton. Although Walkerton was never incorporated as a village, it became a town in 1871, with a population of just under 1000. That increased to 2,604 by 1881, and to 3,061 by 1891 thanks to the arrival of the railroad which enabled the locals to ship their grain. The population dropped to 2,971 by 1901. In May 2000, the water system in Walkerton became contaminated with the highly dangerous O157:H7 Escherichia coli bacteria strain. Nearly half the population fell ill, and seven people died as a result. Samuel Lewis Honey, VC, DCM, MM (9 February 1894 – 30 September 1918) was a soldier in the Canadian Expeditionary Force, and posthumous recipient of the Victoria Cross, the highest military award for gallantry in the face of the enemy given to British and Commonwealth forces, during the First World War. Honey was a graduate of Walkerton District High School. David Milne, considered to be one of Canada's foremost painters, was a graduate of Walkerton District High School. Canadian National softball player and two-time Olympian Alison Bradley was almost a graduate of Walkerton District Secondary School. Singer-songwriter Esthero lived in Walkerton. Matilda Dodge Wilson (October 19, 1883 – September 19, 1967) was born in Walkerton to George and Margaret Rausch (née Glinz). Around 1885, they moved to Detroit. Matilda would marry auto pioneer John Francis Dodge and become one of the wealthiest women in the world after his death. With her second husband, she built the National Historic Landmark Meadow Brook Hall in 1929 and founded Oakland University on her estate. Walkerton has two high schools: Walkerton District Community School (K–12), and Sacred Heart High School. Walkerton also has an elementary school, St. Teresa of Calcutta Catholic School. Walkerton is home to a Junior C hockey team, the Walkerton Hawks, and a Senior A hockey team, the Walkerton Capitals. The town was rumoured to have been placed in the Guinness World Records for having a church on each corner of the jail and courthouse complex. This is proven, and it has been covered by Ripley's Believe It or Not!. ^ a b "Population and dwelling counts, for Canada, provinces and territories, and population centres, 2011 and 2006 censuses". Statistics Canada, 2006 Census of Population. Retrieved 2013-05-07. ^ "Inside Walkerton: Canada's worst-ever E. coli contamination". CBC News. CBC. Retrieved December 1, 2014. ^ "Walkerton & District Chamber of Commerce: History". 2006. Retrieved 2008-06-08. 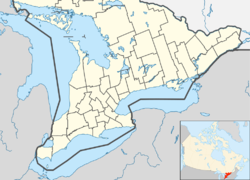 Wikimedia Commons has media related to Walkerton, Ontario. This page was last edited on 16 November 2018, at 16:11 (UTC).